For some time now, I've been slowly reading Red Pine's translation of Lao-Tzu's Taoteching, which has the Chinese characters next to the translation. Gradually I am learning to recognize some Chinese characters. In particular, I've been looking for 和 because I have a small framed calligraphy of the characters 和平, with the word "peace" below it. I had noticed 知 (knowledge) because it looks similar to 和. Finally, in the 55th verse, I saw 和 in a line translated as "knowing how to be balanced we endure." Just now I was able to figure out, via the internet, that the framed calligraphy is made up of the characters he 和 and ping 平. 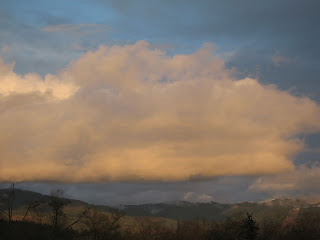 Yesterday we had snow mixed with rain in the morning and exquisite sunshine illuminating the clouds to the east in the late afternoon. "knowing how to be balanced we endure." has special meaning today.